From critter antics to farm chores to domestic bliss, musings from our farmtastic life to yours. As I’ve mentioned in past posts, grace is definitely not my middle name. Cowboy could tell you stories of my many trips and falls, and over the years I’ve learned to roll with it and simply laugh. So when I decided to take a yoga class in town, it was with excitement and a supreme willingness to laugh at myself because I knew if one thing was true, it would definitely be amusing. Having recently had a birthday, I decided it was time to use it as a little inspiration to focus on some new healthy habits. I’ve started walking, and thought a class or two would be fun to add to the mix. Being that I’ve always wanted to improve my balance, yoga sounded like the perfect fit. Again, willingness to laugh required. So I put on the yoga pants, which by the way should only be worn to an actual yoga class or at home, grabbed the yoga mat, and headed for class. I had absolutely no idea what to expect. I walked into a room full of ladies of all ages, shapes, and sizes who greeted me warmly. “Okay, maybe this won’t be so bad,” I think. Artsy music was playing in the background with requisite chirping birds, strings, and pan flute. In my head, all I could think was Yanni. (Anyone else remember him?) Scents of lavender wafted through the air, and a Namaste sign was sitting at the front of the room. Can you picture it? While soothing, this also just made me giggle on the inside, as it seemed so serious for the what I knew would be exercise shenanigans for me. I found a spot in the back of the room in the corner. I wanted as many walls to hold onto as possible. Heck, I probably should have been doing this in a stall of some sort. The lights lowered and the games began. Standing, bending, stretching, sitting, bending, standing. “Okay, I’m not dying yet,” I think as I start to relax. Granted, touching my toes seems like a feat for Gumby, but I’m keeping up, somewhat. Until, we start to go faster. We (and by we, I mean everyone else), easily flows from one position to another. They are on their stomachs, their feet, folding like origami with their feet in front of and behind them. Holy batman, I can’t keep up. I’m wrestling with one leg then the other, twisting myself into a pretzel. Okay, we’re back to standing, and I thank my lucky stars that I picked a corner. And then it happens. That quintessential Yoga pose – standing on one leg with the other leg lifted and foot against your calf (or heaven forbid your thigh). I weebled and wobbled and couldn’t even get my toes past my ankle or off the floor. Combined with my arm on the wall, I think I created a new move called the tripod. Class finally comes to a close and we are all laying on our mats eyes closed, meditating or praying. I’m praying and thanking God in heaven that I did not break anything. When suddenly with my eyes shut something drops on my face. “Let’s not panic,” I tell myself. I inhale deeply and realize the instructor has put a cloth over my eyes that is laced with lavender – and by lavender I mean an entire field. “Don’t breathe, don’t breathe, don’t breathe,” I tell myself. I lay there for what feels like an eternity, and then I swear I thought I heard instructions to twist your hips and stretch. So there I am, flopped out on my mat, eyes covered, stretching away, legs twisted, when I hear lots of shuffling. “Oh no, maybe I’m not supposed to be doing this,” I think. Class finally ends with a group “namaste,” and which point I quell my inner desire to yell, “Yehaw!” Everyone parts with well wishes and see-ya-next-times. And I survived. And I’ll likely do it again. Maybe if i do enough yoga, I’ll be able to easily balance on fence rails or even shimmy across the ice to beak up frozen water troughs this winter. A girl can dream, can’t she? Photos largely omitted to protect the innocent, namely me. 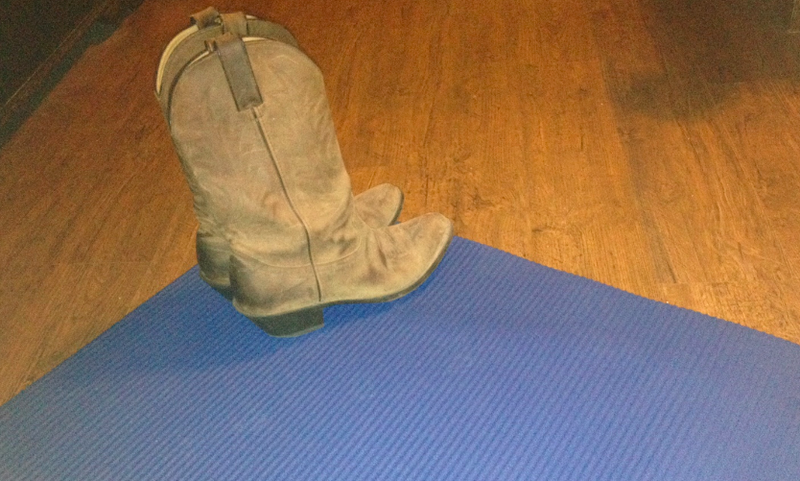 A farmgirl does yoga. You get the gist. P.S. – The local instructor was super nice, gracious, and welcoming. This experience purely speaks to my athletic prowess, or lack thereof. Enter your email address to follow My Farmtastic Life and receive notifications of new posts by email. “I’ll take an inspired attempt over soulless perfection any day.” — Keith Urban.